A blend of Indian and Ceylon teas, it is the addition of bergamot which defines Earl Grey. A type of citrus fruit synonymous with, but not exclusive to, the Bergamot region of southern Italy, is what gives this consistently popular tea its unmistakable tang. 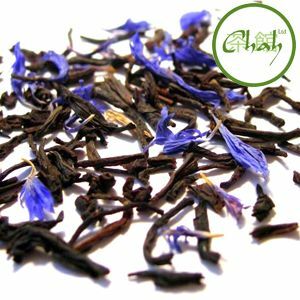 Chah's offering really is how Earl Grey Tea should taste; superior quality whole leaf tea that is scented with both the traditional bergamot as well as blue cornflowers to produce a tea that will delight the eyes and mouth alike. The exact origin of this tea is uncertain, with many contradictory legends surrounding it. Named after Earl Charles Grey II, who was British Prime Minister from 1830 until his retirement in 1834, and who is perhaps more notably and fondly remembered for presiding over the reform act of 1833 which abolished slavery. It’s fitting that such a great man should have such a great tea named after him.